Air Wisconsin Airlines is a regional airline based at Appleton International Airport in the town of Greenville, Wisconsin, United States, near Appleton. Air Wisconsin previously operated US Airways Express service on behalf of US Airways prior to becoming an American Eagle regional air carrier. As of March 2018, Air Wisconsin operates exclusively as a United Express regional air carrier with primary hubs to located at Chicago O'Hare International Airport (ORD) and Washington Dulles International Airport (IAD). In 1963 investors from the Fox Cities raised $110,000 ($900207 adjusting for inflation) to start a new airline. The airline was established as an independent commuter air carrier in 1965 and started operations on August 23, 1965, just one day after the brand new Outagamie County Regional Airport was opened using de Havilland Dove commuter aircraft configured with nine passenger seats. It was founded to connect Appleton with Chicago and initially had 17 employees and two de Havilland Dove aircraft. According to the August 23, 1965 Air Wisconsin timetable, the airline was flying one route between Appleton and Chicago O'Hare Airport with four round trips on weekdays and two round trips on Saturdays and Sundays operated with the British-manufactured Dove twin prop aircraft. By the mid 1970s, Air Wisconsin was flying two small commuter turboprop airliner types, being the de Havilland Canada DHC-6 Twin Otter and Swearingen Metro, and was operating a small hub at Chicago O'Hare Airport with service primarily to destinations in Indiana, Michigan, and Wisconsin as well as to Minneapolis/Saint Paul from several small cities in Wisconsin. In September 1978 the airline was certified by the Civil Aeronautics Board (CAB) as a regional air carrier (Air Wisconsin previously had commuter air carrier status with the CAB). In October 1978 it had over $10 million in assets. Joining Air Wisconsin in 1965 as traffic manager and eventually becoming president, Preston H. Wilbourne's leadership oversaw Air Wisconsin grow to an airline serving 29 cities in an eleven state area with 32 aircraft boarding over 10,000 passengers daily. Air Wisconsin gained the nicknames "Air Willy" and "Rag Tag" and more recently "Air Wis" and "Air Wisky". 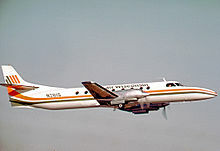 By 1985, Air Wisconsin had become large independent regional air carrier operating British Aerospace BAe 146-200 and British Aircraft Corporation BAC One-Eleven jets as well as de Havilland Canada DHC-7 Dash 7 turboprops with flights as far west as Grand Island, Nebraska and Minneapolis/Saint Paul, and as far east as Bridgeport and New Haven, Connecticut with a large connecting hub located at Chicago O'Hare Airport (ORD). By early 1986, the airline was serving sixteen airports with its British-manufactured jets with flights to Appleton, Bridgeport, Cedar Rapids, Iowa, Chicago O'Hare Airport, Flint, Michigan, Fort Wayne, Indiana, Grand Island, Green Bay, Wisconsin, Kalamazoo, Michigan, Lincoln, Nebraska, Moline, Illinois/Quad Cities, New Haven, South Bend, Indiana, Toledo, Ohio, Waterloo, Iowa and Wausau/Stevens Point, Wisconsin with other flights and destinations in its route system being served with the Canadian-manufactured four engine Dash 7 turboprop. Air Wisconsin pioneered the concept of code sharing as a United Express carrier operating on behalf of United Airlines. As an independent air carrier prior to its business agreement with United to provide passenger feed, Air Wisconsin rapidly became the nation's largest regional airline in the 1980s. In 1985 it merged with Mississippi Valley Airlines (MVA) and continued to operate under the Air Wisconsin name. 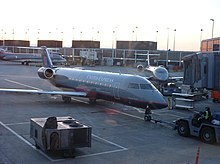 By late 1989 Air Wisconsin was operating United Express code share service from two United hubs: Chicago O'Hare International Airport (ORD) and Washington Dulles International Airport (IAD). 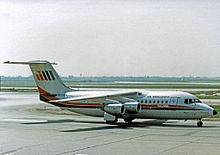 According to the Official Airline Guide (OAG) at this time, United Express flights were operated with British Aerospace BAe 146-200 jets and Fokker F27 Friendship turboprops nonstop to Chicago O'Hare from Akron/Canton, Ohio, Appleton, Cedar Rapids, Champaign, Illinois, Fort Wayne, Green Bay, Kalamazoo, La Crosse, Wisconsin, Lansing, Michigan, Lexington, Kentucky, Moline/Quad Cities, Oshkosh, Wisconsin, Peoria, Illinois, Roanoke, Virginia, South Bend, Toledo, and Wausau, and with BAe 146-200 jets and Short 360 turboprops nonstop to Washington Dulles from Charleston, West Virginia, Charlottesville, Virginia, and Richmond, Virginia, as well as Harrisburg, Reading, and State College, Pennsylvania. In 1990 Air Wisconsin acquired Denver-based Aspen Airways and was itself bought by United Airlines a year later. At one point, Air Wisconsin operated British Aerospace (BAe) ATP turboprop aircraft as well as BAe 146-100, BAe 146-200, and BAe 146-300 jet aircraft on United Express services. These were all large aircraft types when compared to other regional aircraft in operation at the time. Air Wisconsin was the only U.S. operator of the BAe ATP turboprop and also the BAe 146-300, which is the largest member of the BAe 146 family of jet aircraft. United Airlines sold Air Wisconsin and the BAe 146 fleet to CJT Holdings in 1993. Air Wisconsin was then renamed Air Wisconsin Airlines Corporation (AWAC) as UAL retained the rights to the Air Wisconsin name and logo. In April 1995 during the late ski season, Air Wisconsin was operating British Aerospace BAe 146 jet shuttle service as United Express on the former Aspen Airways route between Aspen, Colorado and Denver with at least fourteen daily nonstop flights in each direction. In February 1998 AWAC acquired the assets of Mountain Air Express including Dornier 328 turboprop aircraft which were used to expand United Express service in the west. In the fall of 2003 AWAC acquired ten Canadair CRJ regional jet aircraft from bankrupt Midway Airlines and became a feeder for AirTran Airways under the name AirTran JetConnect, but this relationship was discontinued in July 2004. Towards the end of the contract with United Airlines Air Wisconsin was unable to secure a long-term deal or extension to continue providing regional service for UAL. United failed to renew its contract with AWAC allowing it to expire in April 2005, and the last flight under the United flag operated on April 16, 2006, using the BAe 146. During 2005 AWAC invested $175 million U.S. into US Airways for their bankruptcy exit financing in exchange for a long term contract operating as US Airways Express. 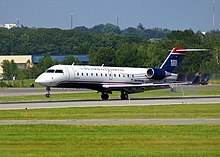 In 2005 AWAC began operating all of its Canadair CRJ200 regional jets as a US Airways Express carrier with flight crew bases located in Philadelphia, New York LaGuardia, Washington Reagan National, and Norfolk, Virginia. US Airways has since merged with American Airlines and Air Wisconsin operated as an American Eagle regional air carrier via a code sharing agreement with American until March 2018. On November 20, 2014, it was reported that Air Wisconsin was nearing an agreement with Delta Air Lines to fly as a Delta Connection carrier beginning in January 2015. Under the terms of the deal, 26 Bombardier (formerly Canadair) CRJ200 aircraft were to be transferred to Air Wisconsin from Endeavor Air. In January 2015, Air Wisconsin said that negotiations had ended and that it did not want to fly under the Delta Connection brand. In 2016, it was announced that Air Wisconsin would close all of its ground handling operations in all cities served by the air carrier primarily due to the formation of a wholly owned subsidiary of United called United Ground Express. This would leave only three American Eagle ground handling cities served, which the airline deemed uneconomical. On March 1, 2017, Air Wisconsin announced a new agreement with United Airlines to once again operate under the United Express banner upon the expiration of the airline's current agreement with American Eagle in 2018. Additionally, the new agreement with United would provide for the creation of a career pathway program whereby Air Wisconsin pilots would be offered the opportunity to move up to United upon meeting its hiring standards. Air Wisconsin operating as United Express currently serves 75 destinations with nearly 350 flights per day, transporting nearly six million passengers on an annual basis. In 2016, the airline retired four Canadair CRJ regional jet aircraft that had met their structural time limit and sent them to Tupelo Regional Airport (TUP) in Tupelo, Mississippi. Air Wisconsin also contracts aircraft maintenance heavy checks at a facility in Oklahoma City, Oklahoma (OKC). The airline also uses a facility in Rockford, Illinois (RFD) for major structural repairs. Air Wisconsin's primary aircraft painting is located in Fort Worth, Texas – Meacham International (FTW). ^ a b c Norwood, Tom; Wegg, John (2002). North American Airlines Handbook (3rd ed.). Sandpoint, ID: Airways International. p. 5. ISBN 978-0-9653993-8-8. Archived from the original on November 28, 2016. Retrieved October 5, 2018. ^ "Partners". www.airwis.com. Retrieved May 23, 2017. ^ "Profile". Air Wisconsin. Air Wisconsin Airlines Corporation. Retrieved February 10, 2018. ^ "Zoning Map Archived 2011-07-17 at the Wayback Machine." Town of Greenville. June 17, 2009. Retrieved on June 17, 2009. ^ "Contact Air Wisconsin Archived 2011-06-04 at the Wayback Machine." Air Wisconsin. Retrieved on May 19, 2009. ^ Mader, Becca. "Appleton's Air Wisconsin cuts costs to remain competitive." The Business Journal of Milwaukee. May 17, 2004. Retrieved on May 19, 2009. ^ "Partners". Airwis.com. Retrieved July 3, 2017. ^ "In the Air". Airwis.com. Retrieved July 3, 2017. ^ a b c "Air Wisconsin: Commuter Success Story." Flight International. October 21, 1978. p. 1464. ^ "History - Appleton International Airport (ATW)". Appleton International Airport (ATW). Retrieved January 6, 2018. ^ "History". Airwis.com. Retrieved July 3, 2017. ^ "Directory: World Airlines". Flight International. March 27, 2007. p. 69. ^ "Air Wisconsin nearing deal with Delta for 26 CRJ200s". Flightglobal.com. Retrieved July 3, 2017. ^ March 2, 2017 Mark Nensel (March 2, 2017). "United Airlines signs five-year CPA with Air Wisconsin | Airports & Routes content from". ATWOnline. Retrieved July 3, 2017. ^ "Profile". Airwis.com. Retrieved February 4, 2018. ^ "Crew Domicile Locations". Airwis.com. Retrieved February 4, 2018. ^ "Global Airline Guide 2016 (Part Two)". Airliner World (November 2016): 37. ^ "Profile". www.airwis.com. Retrieved June 18, 2018. ^ "Aircraft Accident Report North Central Airlines, Inc. Allison Convair 340/440ICV-580, N90858 and Air, Wisconsin Inc., DHC-6, N4043B near Appleton, Wisconsin June 29, 1972" (PDF). National Transportation Safety Board. April 25, 1973. Retrieved May 17, 2010. ^ "Aircraft Accident Report Air Wisconsin Inc. Swearingen SA-226 Metro N650S Valley, Nebraska June 12, 1980" (PDF). National Transportation Safety Board. December 9, 1980. Retrieved May 17, 2010. ^ "Aircraft Accident Report Air Wisconsin Airlines. Bombardier CL600-2B19, Providence, RI December 16, 2007". National Transportation Safety Board. Wikimedia Commons has media related to Air Wisconsin.